For over a decade now China has been drafting environmental protection laws at a rapid clip. And it’s no wonder. 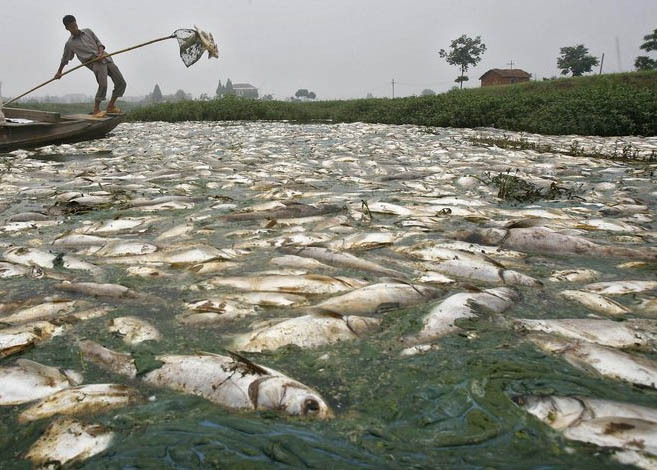 From 1980 to 2000, the Chinese government’s singular focus on economic growth has put the environment in grave jeopardy, with cancer villages sprouting up throughout the country, toxic air a common occurrence and polluted waters killing fish and people’s livelihoods. But laws on the books are meaningless if not properly enforced and part of that enforcement often takes the route of citizen lawsuits, especially in the environmental realm. In China, a country that intentionally keeps its statistics and information opaque, it’s often difficult to see what is happening on the ground let alone in the courts. Until now. Enter Environmental Litigation in China: A Study in Political Ambivalence , a new book by Rachel Stern, an assistant professor of law and political science at the University of California, Berkeley. The book is perhaps the most significant contribution to the pantheon of books on China’s legal development published in the past ten years. Through on the ground research, including review of hundreds of legal cases, interviews with lawyers, judges, government officials and average citizens, Environmental Litigation in China is not some theoretical analysis of the law. Rather it provides a concrete example of law in action in China. Then comes the more practical aspects of the book. Chapter 2 – “From Dispute to Decision” – is a gem. 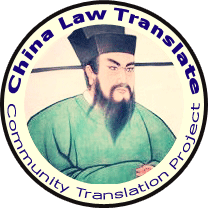 It describes in detail the unfolding of an environmental case in China – how citizens hook up with lawyers, the exorbitant rates of filing fees, how cases often fail to be “accepted” by the case-filing division (li’an ting), the use of evidence at trial, and the enforcement mechanisms of the court. Even for long-term China law watchers, this chapter provides a great resource to the various stages and venues for court cases and the intricate rules that govern both. In line with presenting the realities of litigation in China, Environmental Litigation in China goes on to describe some of the major players in environmental law in China – the judges, the lawyers, the media, the Party and the international NGOs. For each actor, Prof. Stern describes many of the limitations that leave the environmental law field from developing. 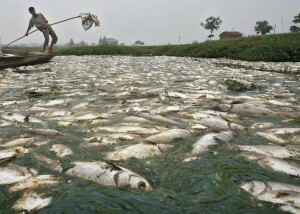 Dead fish – a common occurrence in China’s polluted waters. six-plus year project for Prof. Stern, with many trips to China and interviews with hundreds of individuals. Interspersed throughout the book are these people’s analysis of why they did certain things and how they believe the law is developing. Getting inside of these actors’ heads is invaluable to understanding how those who are shaping environmental law currently perceive it. It’s one thing for an outside scholar to hypothesize a law’s limits; it’s another thing to hear it from the lawyer or the judge herself. Environmental Litigation in China is a great book and an important study, but if you are a looking for a feel-good conclusion, this is not it. Ultimately, it is the mechanics of China’s unique system – the importance of business to the local tax base, the tying of the local judiciary to the local Communist Party and the debilitating fear of the Chinese Communist Party to allow the law to just take its course – that undermines environmental justice and a rule of law for the average citizen. And that’s the one and only critique that could be made of the book – that perhaps it doesn’t look enough at some of the positives. Chapter 3 – “Frontiers in Environmental Law” – discusses two environmental cases and then compares them to two situations where the people opted to go outside of the courts. The two traditional legal cases, while “victories” ultimately provided little compensation for the damage. But the last two cases, where the people decided not to file a legal case, demonstrate the creativity that citizens use to enforce their rights in place of a broken legal system. In particular, the citizens of Shanghai whose international media blitz, banners on the tops of buildings that could not be easily taken down, and weekly demonstrations resulted in the plan to build a maglev train in their backyard from being completely shelved. Yes, this wasn’t the use of law and it probably makes Western legal scholars uncomfortable in the use of messier tactics such as demonstrations and outright public shaming. But it got results and results more quickly than any legal case could. And make no mistake, this is not just a tactic used in China. Rather it is a tactic in any legal system, including the United States – using outside legal means, including the press, to achieve justice for society’s underdog is common. 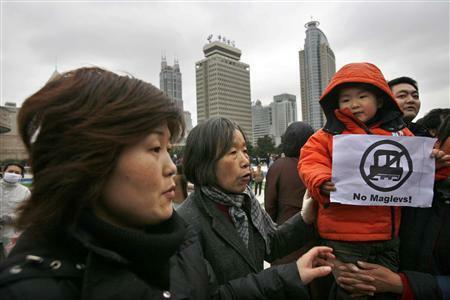 It is this development of a rights consciousness among these Shanghai residents and their effective tactics that is an important part of China’s legal development that could have been discussed a bit more. Ultimately this is a minor point in what is an amazing study of China’s recent legal development. Environmental Litigation in China: A Study in Political Ambivalence is a necessary read for all China scholars, and even more so for those who teach a Chinese law class. The book itself – with its clear, concise and direct style – could serve as the textbook for the course. And although it does not provide for great optimism in the present system, it does provide for hope. 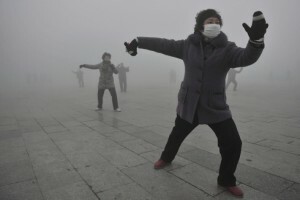 The fact that one of the judges on an environmental case was a student of an environmental clinic at her law school, the fact that the Environmental Protection Bureau officials often leave to become aggressive “cause” lawyers, the fact that average citizens are looking for ways to achieve justice, these are all hopeful signs for the future of environmental litigation in China.